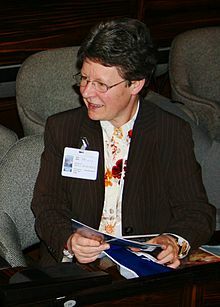 수전 조셀린 벨 버넬 여사(영어: Dame Susan Jocelyn Bell Burnell, DBE, FRS, 1943년 7월 15일 ~ )는 북아일랜드 벨파스트에서 태어난 영국의 천체물리학자로, 대학원생 때 앤터니 휴이시의 지도를 받아 논문을 쓰다가 최초로 펄서를 발견했다. 그러나 펄서를 관측한 것은 벨 버넬이었음에도 휴이시만 노벨 물리학상을 받고 벨 버넬은 제외되었다. 벨 버넬은 2002년부터 2004년까지 왕립천문학회(Royal Astronomical Society) 회장을 지냈으며, 2008년 10월부터 2010년 10월까지 영국 물리학 연구소(Institute of Physics) 소장을 지냈다. 후임자 마셜 스토넘(Marshall Stoneham)이 사망함에 따라 임시 소장을 맡았고, 2011년에 피터 나이트(Peter Knight)가 후임 소장이 되었다. ↑ Pilkington, J. D. H.; Hewish, A.; Bell, S. J.; Cole, T. W. (1968). "Observations of some further Pulsed Radio Sources". Nature 218 (5137): 126. doi:10.1038/218126a0. ↑ Hargittai, István (2003). The road to Stockholm : Nobel Prizes, science, and scientists. Oxford: Oxford University Press. 240쪽. ISBN 0198607857. 이 문서는 2019년 2월 24일 (일) 02:39에 마지막으로 편집되었습니다.